All transactions are safe and secure with a reliable history in online purchasing behind each of our associates. 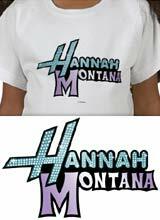 Buy the Hannah Montana logo t-shirt to own Hannah Montana clothing and merchandise. The official Disney Hannah Montana tee shown on the left features the familiar TV show logo design. The name "Hannah" is displayed in light blue stage light style text, which helps to give the tee a pop star look. Enjoy the best of both worlds in this easily recognizable piece of Hannah Montana clothing. Go to school by day and live out your dreams as an undercover pop star at night. This design is also available on Hannah Montana sweatshirts and hoodies. In addition to youth merchandise, the design is available on adult clothing items. In addition to the Hannah Montana logo tee above, browse the Hannah Montana Clothing Gallery for more apparel like men's and women's clothes, kids shirts or hoodies.